Photo by Jacqueline Bennett 6/17/2014 The former Hartford Times building in downtown Hartford, Connecticut. The Hartford Times was an afternoon daily that served the city of Hartford, Connecticut and beyond for some 150 years, earliest publication dates vary from 1817 to 1826, through to 1976. Although the once grand newspaper ceased publication thirty-eight years ago, the marvelous building with its tall pillars that housed it has remained standing. Soon it will become UConn Hartford, an urban extension of the University of Connecticut that has its main campus in Storrs. 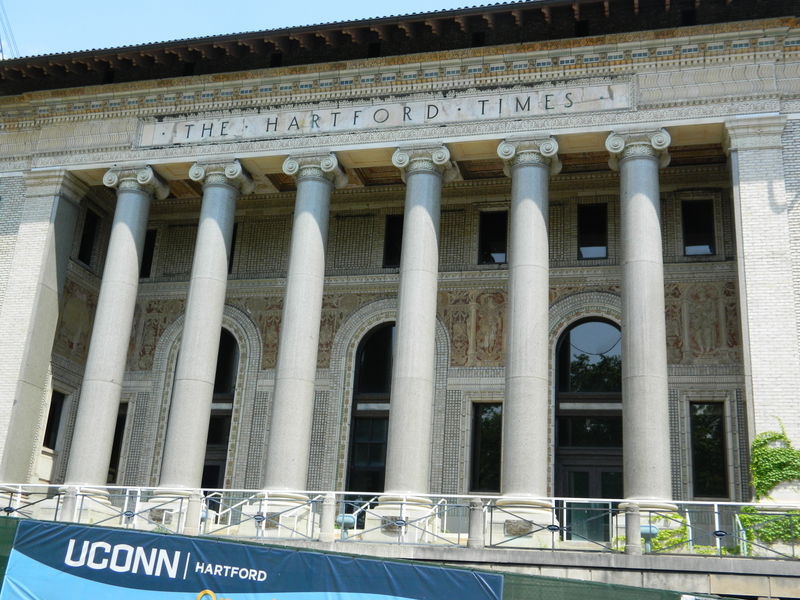 The iconic former Hartford Times building will be the centerpiece of the new UCONN HARTFORD downtown campus. An agreement has been reached among the university, the Capital Region Development Authority and the state Office of Policy & Management that will keep the “iconic facade” and add a new attached five-story building, according to UConn Today (today.uconn.edu). Classes are slated to begin in the fall of 2017; estimated cost of the project is more than $100 million. 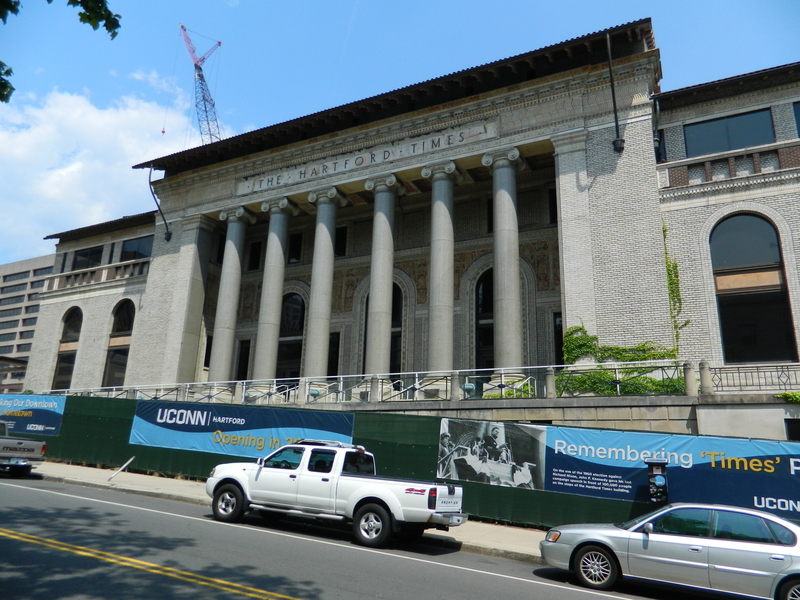 Designed by Robert A.M. Stern Associates, UConn Today reports the former Hartford Times building will be the “centerpiece” of the urban campus which will also feature an exterior courtyard open to the public. Retail stores will be on three sides of the building that is across the street from the Wadsworth Atheneum and nearby city hall, Hartford Public Library, the Connecticut Science Center and the Connecticut Convention Center, the latter two are part of a downtown renaissance currently underway. All of these buildings are in easy walking distance of each other. UConn Today further reports 2,300 commuter students are expected to attend the downtown branch where 250 employees will be based. 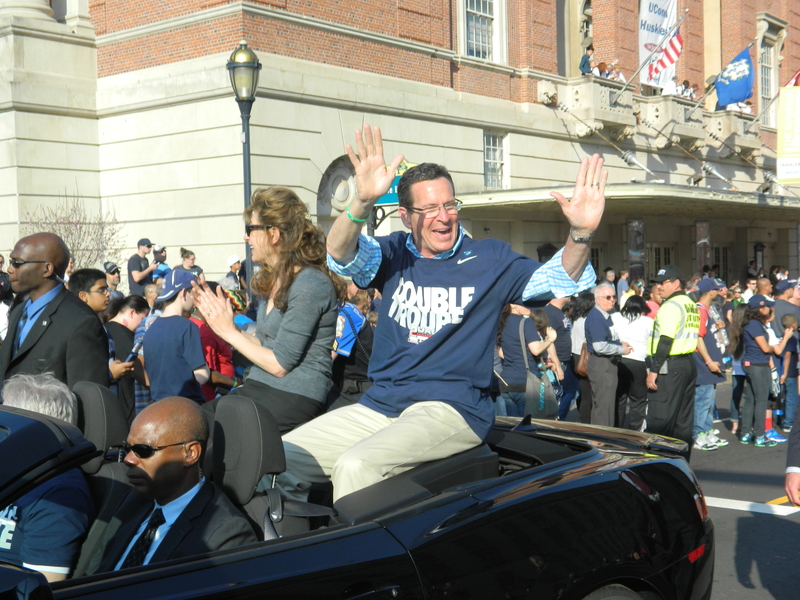 The Graduate Business Learning Center will be “consolidated” at the UConn Hartford campus and other programs will have a presence here, such as the Department of Public Policy and the School of Social Work, as well as, the addition of a master’s degree program in engineering. UConn President Susan Herbst has noted that before moving to West Hartford in 1970, the university had a Hartford site beginning in 1939. One big plus noted for UConn Hartford will be its closer proximity to downtown internships and service projects.